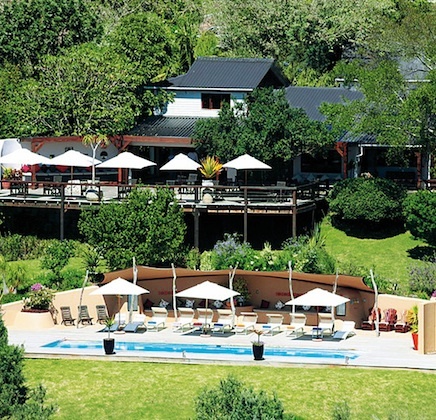 Hog Hollow is located near the vibrant coastal towns of Plettenberg Bay and Knysna, along South Africa’s Garden Route. Hog Hollow overlooks the indigenous forest and the Matjies River Gorge offering 4-star accommodation, friendly service and panoramic views of the valleys and peaks of the Tsitsikamma Mountains. At breakfast, our hosts help plan our guests’ day with all the necessary maps and information, a delicious picnic basket and a washed car! An abundance of activities await in Knysna and Plett – renowned as beautiful beach and holiday destinations. Some of the closest attractions include Monkeyland Primate Sanctuary, Birds of Eden, and the Elephant Sanctuary. Some of the best sites in South Africa! The serene setting of Hog Hollow allows guest to unwind and relax in style and comfort. Lodge facilities include three spacious lounge areas, and a boma deck which leads down to the pool area. Bird lovers will enjoy the Ficus lounge – a most popular ‘stopover’ with the local bird community. In the large dining area guests will enjoy breakfasts on cooler days, or enjoy a candle lit dinner in the evening. The outdoor boma is perfect for festive occasions and warm evenings. The lodge is made up of 16 luxurious suites, 3 of which are double story and perfect for families with children aged 12 and under. A short walk from the main lodge is the Villa at Hog Hollow. This is a three bedroom double story home-away-from-home for the exclusive use of friends or family, accommodating up to 6 adults and perfect for self-catering holidays (a private chef can also be requested in advance). The villa offers spectacular views and opens up onto a wooden deck and infinity pool. The house boasts a spacious, sunny lounge, a game room and an open plan kitchen and indoor and outdoor dining areas.